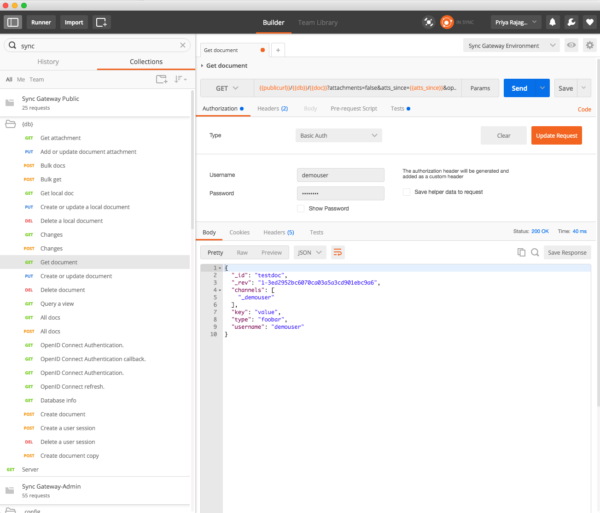 This post discusses a convenient way to query, explore and test the REST API exposed by the Couchbase Mobile Sync Gateway using the Postman Chrome Developer tool. Sync Gateway exposes a REST, Batch & Stream interface that allows clients interact with it over the Internet. Couchbase Sync Gateway is part of the Couchbase Mobile stack and is an Internet-facing synchronization mechanism that securely syncs data across devices as well as between devices and the cloud. There are two ports over which the Sync Gateway listens to requests- The Admin port (defaults to 4985) and the Public port (defaults to 4984). In production deployments, the admin port is typically blocked from access over the Internet. Please follow instructions in the blog post to install the the Sync Gateway in your Mac OS development environment. See the downloads site for all the available packages, and the full installation guide for complete details. To install on Linux distributions other than the supported ones, see this post. Postman is a Chrome Developer tool that can be downloaded for free from the Chrome browser web store . The Postman collection files and environment definition for the Admin and Public interface of the Sync Gateway is available for download from this Github Repo. Follow the steps in the video below to import the collections that were downloaded in the previous step. Follow the steps in the video below to set the environment to the one that you just imported. Update the values of the variables to suit your environment. Make sure that the adminurl points to the Sync Gateway at Admin Port and the publicurl variable points to the Sync Gateway at Public port. It defaults to http://localhost:4985 and http://localhost:4984 respectively. The following is a demonstration of running a request on the Public Interface. Make sure you set the authorization header is set appropriately to use the appropriate authentication mechanism. If you are interested in executing the Postman Collection from the command line interface, which may be the case for instance, if you want to integrate this as part of your Continuous Integration process, then you should check out Newman, which is CLI runner for Postman. For example, the command below will run the Sync-Gateway-Admin.postman_collection with the Sync-Gateway-Environment file. If your Sync Gateway is running with SSL enabled and is using a self-signed certificate, the “-k” option will suppress validation of the cert (“insecure” SSL connection). This is not recommended in production environments. The Postman Collections provide an easy way to query, explore and test the REST interface exposed by the Sync Gateway. If you see an issue in the collections definitions or if you would like to enhance it, please submit a Pull Request to the Github Repo. If you have further questions, feel free to reach out to me at Twitter @rajagp or email me priya.rajagopal@couchbase.com. The Couchbase Mobile Dev Forums is another great place to get your mobile related questions answered . Also, checkout out the Couchbase Sync Gateway API Definitions for details on the web interface. good example, postman is a good tools to understand Sync Gateway REST API, it is also a good test tools to test your Sync Gateway business logic. If you like CLI to run test user case,I recommend [newman](https://github.com/postmanlabs/newman) to run postman collections,which was the tools I am using for test my sync gateway logic. add 300ms for –delay-request to avoid query _changes feed with “normal” and “since” returns empty results first time.